Wait until your pygmy doe is at least a year old before breeding her to allow her to mature. Breed her to a small buck so her kids don't end up too large for a natural birth. Consult a veterinarian or experienced goat breeder if your goat hasn’t given birth within two hours of the water sac breaking or the kid is in an abnormal position. 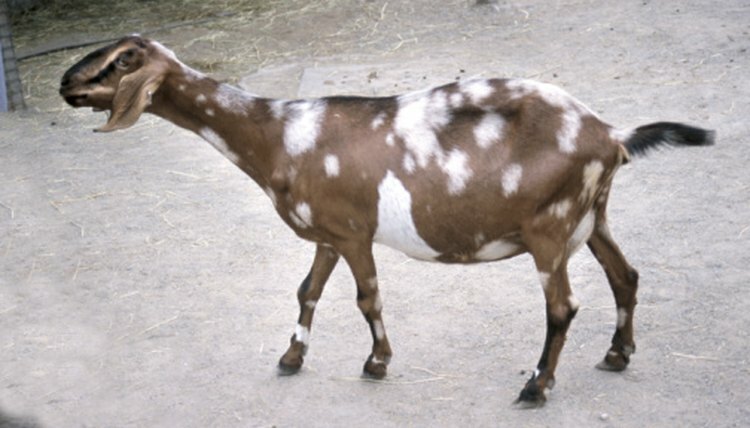 Pygmy goats often have problems giving birth normally due to a narrowed birth canal resulting from excess fat deposits. An emergency C-section may need to be performed to save your doe and her kid(s). All goats, pygmies included, may show one or many signs of imminent kidding -- some obvious and some subtle. Watch for behavior that is not normal for your goat. The first sign of impending labor should become apparent weeks prior to the birth. Put your pygmy goat in her own area to give her privacy when she starts pawing at bedding to make a nest. This will allow you to easily observe her and be there for her if she needs help. Pygmy goats tend to have more problems giving birth than other breeds, due to their small size. Check your goat’s udder in the weeks before her expected delivery date. You should see that it gradually becomes enlarged. The delivery should only be a day or two away when it fills up with milk and is tight. Observe the ligaments at the base of the tail. These signs can be difficult to see, but if the ligaments look loose, the tail feels loose and her hips look sunken, these are more indications that your goat is probably a day or two away from delivery. Monitor her food intake. She may not want to eat or will pick at her food. Look under your goat’s eyelids. Delivery is just hours away if they are bloodshot. Feel if the kids are moving. There are still at least 12 hours to go before delivery if you can feel them moving. They will move very little or not at all once they move into the birthing position. Pay attention to your goat’s movements. Signs of contractions and early labor include restlessness and your goat putting her head on her flank while vocalizing. You may catch her staring for up to a minute at a time. Her breaths will become long and heavy and she’ll have a worried look once the contractions progress. Watch for the mucous plug to be expelled, followed by strings of mucous. Generally birth will follow within eight hours. Delivery is not far away once the strings become elongated. Expect the water sac to break. The liquid that is released is actually amniotic fluid. The sac will usually burst up to two hours before delivery. Be prepared for your goat to give birth soon after she lies down and her tail rises and falls each time she bleats. This means she is in heavy labor. She will start pushing, may throw her head backward while screaming and will stretch her legs out. You should see progress within 30 minutes. Soon you should see tiny hooves emerging followed by a nose.